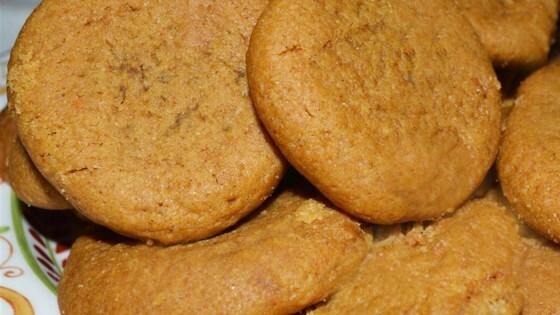 "If you are looking for a soft ginger cookie - here it is!! This is a scrumptious cold weather treat, and a perfect partner to a mug of steaming hot cocoa. Enjoy!!" Cream the butter for 2 minutes at medium speed. Add 2 1/2 cups of the flour plus the sugar, molasses, egg, lemon extract, cinnamon, ginger, cloves, baking soda and salt. Mix well on medium-high speed. Stir in the remaining flour until blended. Cover and refrigerate dough for at least 2 hours. Remove dough from refrigerator, and with a teaspoon, scoop out rounded measures of dough. Roll dough into balls and place 2 inches apart on ungreased cookie sheet. Flatten slightly with the bottom of a glass dipped in white sugar. Bake at 350 degrees F (175 degrees C) for 11 minutes. Let stand for approximately for 30 seconds on cookie sheet before removing to cooling racks. Cool completely and store in airtight containers. Watch how to make a wonderfully versatile sugar cookie recipe. I am sorry but I truly enjoyed this recipe, as did my children. this is a great cookie! my kids looooooooved it, as did my husband...it's a keeper! This dough was very crumbly and hard to work with when rolling the balls for the cookies. Maybe less flour would help. They were soft and tasted okay, my 3 year old liked them. I also found the dough dry, crumbly and difficult to work with. I also found the cookies bland. Not worth the trouble.